This is a First-Person Shooter experience based on Games Workshop's classic Space Hulk boardgame set in the universe of Warhammer 40,000. It was developed on Unreal Engine 4, and offers you and up to three of your friends the chance to experience a desperate battle against Genestealers in the claustrophobic tunnels of a Space Hulk. You also gain skills, new abilities, and new equipment as you earn experience during missions. Space Hulks drift along the currents of the Warp, the immaterial dimension of Chaos. Made up of gigantic, mangled asteroids, ship wrecks, and other stellar debris, they can grow to the size of a moon, and often contain treasured and ancient lost technologies. They are often also infested with broods of the lethal Genestealer. 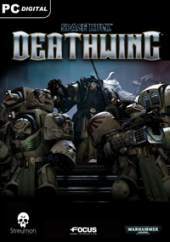 In the game you take on the role of a Space Marine from one of the most secret and most feared Space Marine forces: the Deathwing of the Dark Angels Chapter. As a Librarian, you can also master the destructive powers of the Psykers. Your skills and performance in battle grant you Fervor Points to spend on 3 skill trees, allowing you to improve your abilities and unlock new powers. Don your Terminator armour and arm yourself with the iconic weaponry of the Space Marines and face the threats that await you in the Space Hulk. Take on the role of a Space Marine Terminator from the most secret and feared Deathwing. Plunge into the claustrophobic tunnels of a Space Hulk. and experience a desperate battle against the Genestealers. Unlock new abilities through 3 skill trees. Customize your armor and access devastating weapons. Coop mode: play with your friends as a Terminator squad in an epic coop mode. On May 22/2018, an Enhanced Edition was released as free upgrade for original game owners with new Special Missions game mode which brings infinite replayability to both solo and multiplayer modes, with randomly-generated objectives and enemy spawns for every game chapter. New Chaplain class which is a powerful addition to any Terminator squad. Wielding the Crozius Arcanum power mace, the Chaplain's armour allows him to fearlessly wade into even the fiercest Genestealer swarms. Three new weapons will the arsenal of players in both solo and multiplayer, including the devastating Stormbolter Mk. II! Plunge into the Space Hulk and experience a desperate battle against the Genestealers, including new, deadlier enemies. Customize each class in solo and multiplayer and unlock devastating weapons, including an expanded arsenal exclusive to the Enhanced Edition.